Joe & Seph's is a gourmet popcorn manufacturer in the UK. I discovered their products on my first trip to London a few years ago, and I'm always eager to try their new flavors, as, well, the range is extensive. For example, consider cheesy popcorn. They don't just make cheddar cheese popcorn ... no, they have blue cheese with walnut & celery. Or goat cheese & black pepper. Or Olive oil, mozzarella, & tomato. Or camembert. The list goes on. But the cheesy popcorns are nothing compared to other options in the savory range, as it includes options like madras curry, black onion seed & lime. Or Thai style peanut satay. And then there are the sweet options, which go far beyond the standard caramel corn (which, of course, they do have too). But you can also get that caramel corn with mirin, soya, & sesame. Or with coconut & cinnamon. Or you can go fruity, opting for toffee apple & cinnamon. Or lemon poppyseed. Or orange marmalade. Or how about orange chocolate? Or strawberries & cream ... yes, in a popcorn. Want something more dessert like? How about strawberry cheesecake? White chocolate & raspberry? Gingerbread? Gingerbread latte? Mince pie? Nutty? Yup, maple syrup & roasted pecan? Honey roasted sesame? The most crazy sounding product line to me is the cocktail collection, with ... gin & tonic (yes, popcorn). Fruity cosmopolitan. Refreshing mojito. Zingy margarita. Brandy butter. Irish coffee liqueur with white chocolate caramel. Espresso martini. Chocolate lovers have options. Nut lovers have options. Booze lovers have options. Those who want it caffeinated have options. Some sound amazing. Some don't. I wanted to try them all. 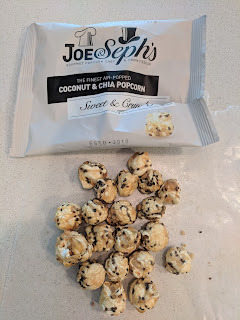 My first encounter with Joe & Seph's was actually on a British Airways flight, and, I think they just had the basic caramel corn. I remember trying it, and thinking it was fine, but I didn't write a review. And then, on my next flight, things got more interesting. The marmite showed up. "We're thrilled to be working with one of Britain's most iconic brands to add another unique flavour to our popcorn range! 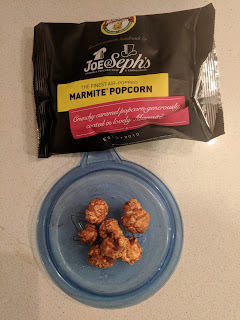 Our Marmite Popcorn has been air-popped and generously coated in our smooth caramel and delicious Marmite, for a sweet and salty snack." I knew this was going to be either something I loved, or hated. I love sweet and salty combinations though, particularly with popcorn (I often alternate between sweet caramel corn and savory cheesy corn by the handful), so, this had potential. I'll start with the positive. The popcorn was large kernels, fresh, all well coated. I think the caramel layer was decent too, but it is a bit hard to evaluate as ... well, that marmite. Wow. Such a strong, strange, strange flavor. I tried to like it, tried to get past the unfamiliarity, but ... it made me want to gag, nearly every bite. And that aftertaste ... shutter. I just couldn't do it. Well made popcorn, but, clearly not the the flavor for me. Coconut & Chia Seed Popcorn. 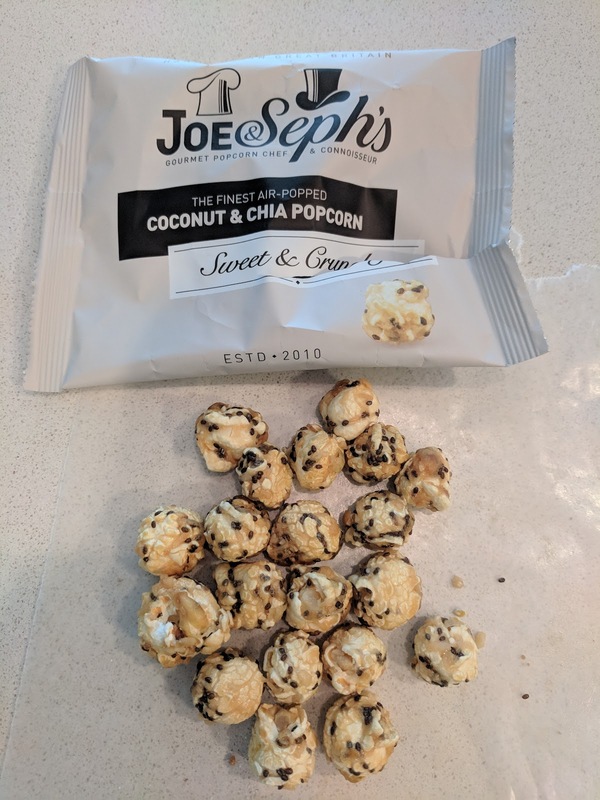 "New for the Summer, our delicious Coconut & Chia seed popcorn is a beautiful blend of smooth caramel, with desiccated coconut and crunchy chia seeds." The next flavor I tried was equally fascinating. Not a flavor I would have ever picked as I hate chia seeds, but, it was what British Airways had to offer on the flight. It wasn't immediately obviously good nor bad. The popcorn was well coated in caramel, again, nice large kernels. Sweet. Crisp. And then it had vague coconut flavor in the background, which actually went nicely with the caramel. And then the chia seeds. They ... weren't offensive. They actually tasted a bit like sesame seeds to me. They added crunch. And a bit of nuttiness. In the end, I think I liked it. 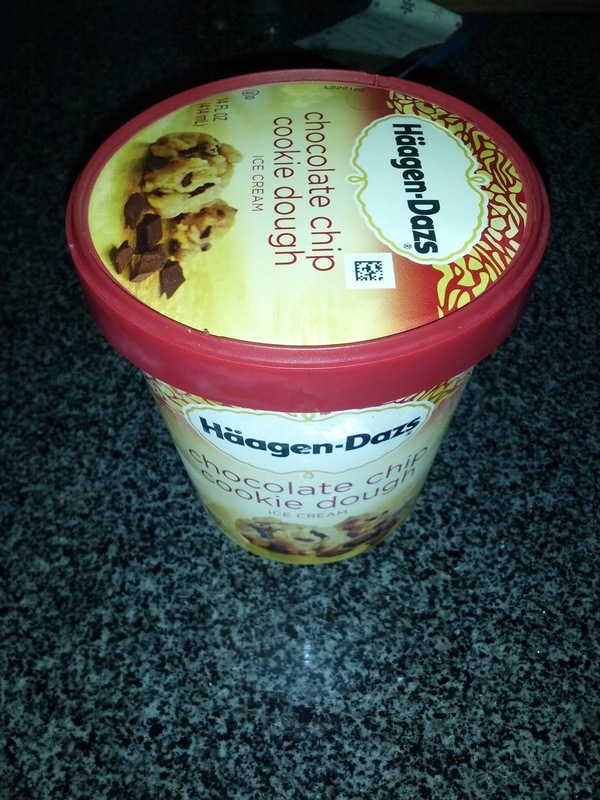 I've reviewed Häagen-Dazs flavors before, so these are just a few updates. "We start with our legendary chocolate ice cream and swirl in ribbons of creamy, smooth peanut butter. The experience is an irresistible blend of flavors in every delicious mouthful." Well, this was delicious. Rich and indulgent. 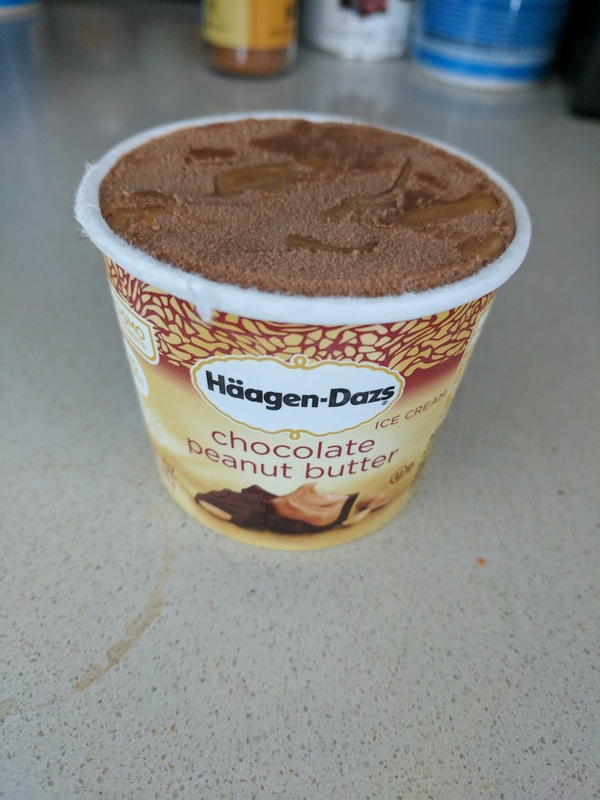 I'm not normally a huge lover of chocolate based ice cream, but, the peanut butter and chocolate combination is one that is hard to resist. 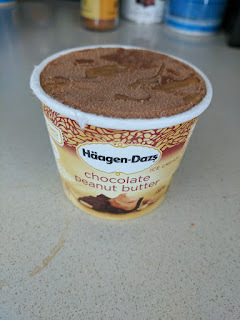 The ice cream was smooth and creamy, and the chocolate flavor fairly deep and rich. A very good base. The peanut butter swirl was excellent. Very creamy, strong peanut butter flavor, smooth, and, most importantly, it came in very big globs. This also melted nicely, and it helped to make it melt a little so the peanut butter also softened. Overall, very good, and I'd gladly have it again. "Celebrate the season with our rendition of this holiday classic. rich white chocolate ice cream is blended with crunchy chocolaty peppermint bark and peppermint candy pieces." I didn't know this was white chocolate ice cream until I looked up the description later. I thought it was a vanilla base. Which tells you about how, uh, white chocolately it was. 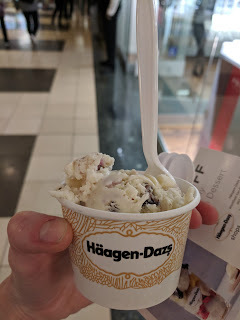 I did like the bits of peppermint bark and peppermint candy though, so I got a scoop. That said, it had a "fake mint" taste to it that I couldn't quite get past. Overall, ok, but I wouldn't get again. "We balance a creamy blend of caramel ice cream and rich caramel swirls with the sweet crunch of chocolaty cone pieces to create a sweet, harmonious bite." This sounded far more exciting than it was. It was just kinda sweet with a few assorted bits of chocolate covered slightly crispy cone chunks. Better than Americone Dream from Ben & Jerry's because the waffle cone pieces weren't soggy at least? I should have read my notes from last time, because, well, my opinion didn't change. "Ribbons of golden caramel and sweet nutty praline pecans swirled into our signature vanilla ice cream." This was very sweet, but about as promised. Lots of caramel, lots of sweet covered pecans. Fine, but you certainly needed to want sweet to enjoy it. Again, I should have read my notes from before, because my opinion is the same. Caramel Cone: “This creamy blend of caramel ice cream with rich caramel swirls balances the sweet crunch of chocolaty-covered cone pieces for a harmonious bite”. Tasting notes: Decent sweet caramel ice cream, nice crunchy chocolate cone pieces. Better than the Ben & Jerry's version of something similar. Praline and Cream: “Ribbons of golden caramel along with sweet and nutty praline pecans swirled into our signature vanilla ice cream.” Tasting notes: super sweet, too much sweet. Spiced Caramel Biscuit: “Crumbles of sugary, crunchy cinnamon-sparked biscuits blended into velvety caramel ice cream.” Tasting notes: Biscuit pieces give a nice crunch, but otherwise boring and forgettable. Strawberry Cheesecake: Tasting notes: just sweet, not good. Vanilla: Tasting notes: This was probably my favorite of theirs, which is crazy, because it is so plain. But it is a decently creamy ice cream with good enough vanilla flavor. I don't ever want a bowl of it plain, but alongside some pie, or topped with berries and whipped cream, it can hit the spot! This one feels almost too easy. And boring. Of course. It is just like grilling, but with more contact points. That is, even better. 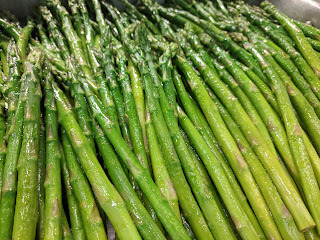 The original was just simple steamed asparagus, with olive oil, salt, and pepper. Very tasty, fresh, young asparagus. It was also good cold the next day, chopped up and thrown onto salad. Or just munched on by the spear. But of course I had other ideas. 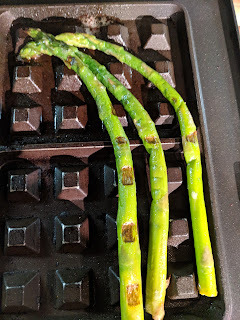 I threw just a few pieces into the waffle iron alongside other items I was waffling. They grilled up perfectly, just as I expected. I loved the slight char from where the waffle iron plates touched. You could let them go for a long time and get super crispy too. 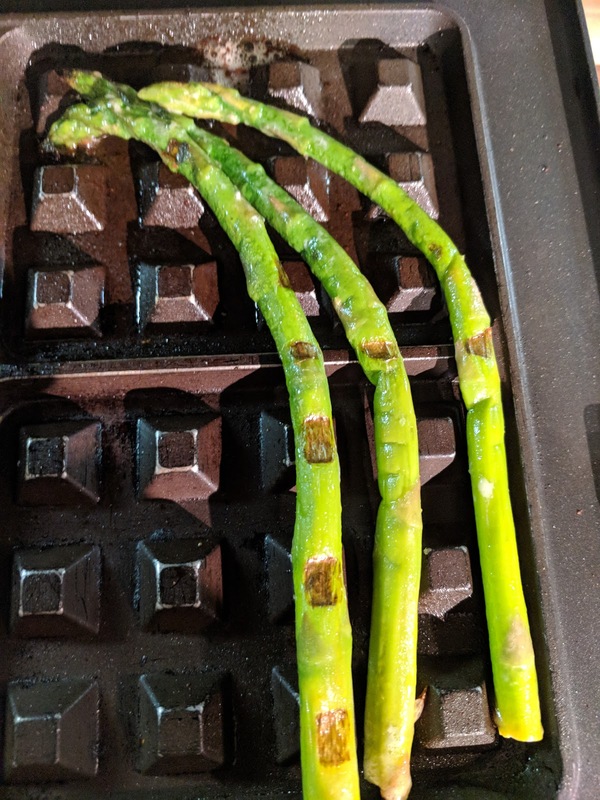 Basically, just grilled asparagus with a few extra contact points, certainly worth the effort if I want it some way other than cold. These are from all my flights in 2017. I'm skipping the general review of Virgin America, and just focusing on the items I ordered, since I've reviewed Virgin America many times now (all below). 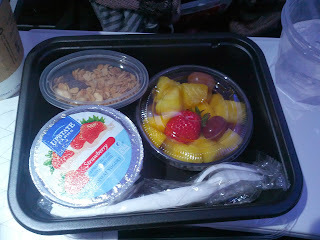 "Blueberry Greek yogurt served with Udi's gluten-free granola and a mixed fresh fruit salad of pineapple, grapes, mango, orange, and strawberry"
My flight was a morning flight, so I went for the single breakfast option: yogurt, granola, and fruit. 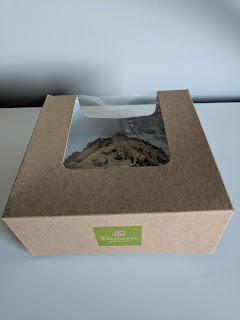 The packaging was interesting - the granola and fruit were each in their own individual containers, but then everything was held together in an extra black plastic box. I’m not really sure why it had such a nice extra box, this seems wasteful, as I don’t think I was expected to mix them together *in* that box, and there must be better ways to hold the three items together that use less packaging. There was also no way to actually make it into a parfait, so you could alternate between a spoonful of yogurt, and a spoonful of granola, but that was about it. Slightly awkward packaging. The yogurt was Chobani blueberry non-fat Greek yogurt, different from what I had several years ago when I got the yogurt/granola/fruit option, but, no better. Sorta thick and creamy, which was fine, but the flavor was awful. Sooo sickeningly fake sweet. I did not like the yogurt at all. The fruit was fairly decent, a mix of pineapple cubes, mango, grapes, strawberry, and orange. The distribution wasn’t great though, a single segment of orange and a single chunk of strawberry, and only two grapes. Mostly pineapple, which was sadly my least favorite element, just very sweet. The strawberry was watery and disappointing. The mango however was surprisingly good, ripe, fresh, and better than most mango I have in the US, and certainly better than expected for being on a flight. Finally, the granola, Udi’s Crunchy Original Granola, just like my previous experience, gluten-free if that matters for you. I again *really* liked it. I think I might need to buy this for myself sometime. Crunchy, sweet, and loaded with fun things like dried banana chips, and bits of nuts (walnuts, pistachios, cashews, and almonds), sweetened with honey. It isn’t the style of granola I normally go for, as it has no clusters, but, I still liked it a lot. Negative marks for the hard as a rock raisins though. Overall, this was a mixed bag, since I couldn’t stay the yogurt. Dry granola and fruit isn’t very enjoyable on its own, and I wished I had milk or something to at least have it like cereal. Still, I really do like the granola, and the fruit was far better than expected. "Black bean hummus, grilled zucchini, roasted yukon gold potatoes, romesco sauce, roasted yellow peppers, sliced tomatoes, Manchego cheese, and arugula. Wrapped in a roasted red pepper tortilla and served with a Spanish fruit salad of orange, kiwi, lime zest, strawberry, and olive oil." 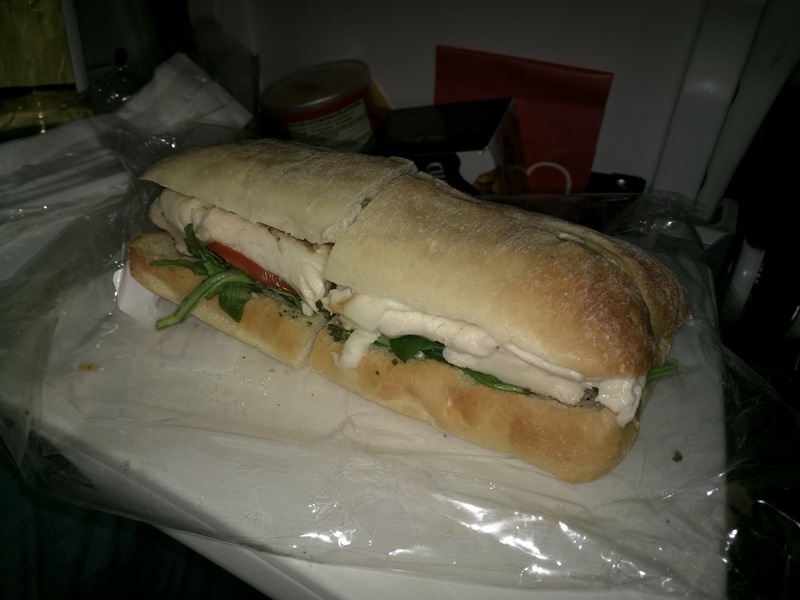 Later on in the flight, I went for a lunch item. My choices, besides the snack boxes, cheese plate, or protein platter, were three sandwiches: PB&J, turkey, or veggie wrap. So, even though the veggie wrap didn't sound up my alley (hummus, meh! ), it seemed the best of the bunch, and it came with (another) fruit salad. The wrap was ... interesting. The red pepper wrap itself was pretty awful, totally soggy and mushy. That part was certainly not successful, and didn't hold up against the moisture of the ingredients inside at all. The stuff inside was pretty good though, and I see why they call this a "Spanish Veggie Wrap", as it certainly had lots of "Spanish" flavor and was quite flavorful. Inside was large cubes of potato, smaller cubes of red tomato and yellow bell peppers, very large slices of zucchini, large shreds of manchego, and a few pieces of arugula, all coated in romesco sauce, with a tiny bit of the hummus against the wrap itself. The potato was al dente, which I don't think was necessarily intentional, and didn't work great inside the wrap, but, as I pulled it out to be more of a salad was really good, just as I like my potato salad. Since I'm not a huge fan of bell peppers, the plentiful cubes of yellow peppers weren't very desirable, but the cubes of tomato were fairly fresh tasting. There were literally three pieces of arugula inside the wrap, so barely noticeable, particularly as they were extremely wilted. The zucchini was dominating, huge, huge slices, also a bit al dente. I didn't like the zucchini. 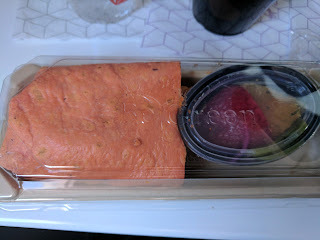 Everything was coated in romesco, which was very flavorful, and the hummus was contained to being attached to the wrap itself, so, very easy to avoid, and honestly, there wasn't much of it. So, was this successful? Well no. The soggy wrap was horrible, the veggies weren't well cooked, and if you actually wanted hummus, this would not have satisfied. However, I extracted all the potato, tomatoes, and cheese, coated in flavorful romesco, and made a quite tasty potato salad out of it, so i was fairly satisfied with it as a side dish. The fruit salad was different from the breakfast yogurt and granola, it still had orange (2 segments this time) and strawberry (still just one chunk), but had a single slice of kiwi instead of mango and pineapple, and was I guess drizzled with olive oil and lime zest? The strawberry was even worse than the breakfast one, extremely soggy. The kiwi was a bit hard. I didn't taste olive oil, but it was clear that it was coated in something. I did get a touch of lime that was nice. Overall not good though. "Israeli cous cous, roasted acorn squash, arugula, radicchio, and herb roasted chicken breast. Garnished with toasted pumpkin seeds, grape tomatoes, and ricotta salata cheese, and served with a maple-Dijon vinaigrette." 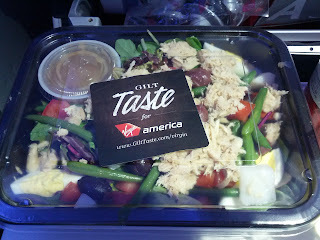 Back when I first started flying with Virgin America, I really liked the salads (like the tuna niçoise on my first flight or roasted pear on the next). Since then, every time I fly, I look forward to the salads, but alas, they never seem to have any available (besides the soba, which I didn't care for). I was thrilled when on a recent flight they did finally have a salad, a "winter salad", filled with some ingredients that really appealed (acorn squash! radicchio! pumpkin seeds!). The salad was a mixed bag. The radicchio and arugula were not the base, rather, more like a side to a cous cous salad. I was hoping the cous cous would be more like a crunchy topping, rather than the main attraction. The greens were rather wilted, but, the concept was good, I like both types and the bitterness worked well. If only they were crisp. The cous cous was ... not good. Large Israeli style pearl cous cous, which I actually like, but ... it was mushy. So mushy. I really didn't care for it. Mixed in with the cous cous was little bits of red pepper, the pumpkin seeds, and ... pine nuts. Ooph. Pine nuts were not listed on the menu, and, after suffering pine nut syndrome last year (go read about it, its horrible, really), I've sworn off pine nuts. They were unavoidable since already mixed in, but, once I realized the cous cous wasn't good anyway, made it easy for me to decide to skip entirely. Instead, I picked out the pumpkin seeds, and happily added them to my arugula and radicchio salad, appreciating the crunch. The acorn squash was also disappointing. The skin was bitter, the squash stringy. Not well prepared. This was particularly sad, since I really like acorn squash. The portion was one half moon. Also in the mix was segments of date, which I really liked. They were sweet and soft, and a nice compliment with the pumpkin seeds. The ricotta salata was a good choice, shredded and on top, although, there really wasn't much of it. The chicken I gave to my companion, since I don't like chicken. Finally, the dressing, really quite tasty. Maple-dijion vinaigrette, very flavorful, sweet, a nice compliment to the biter greens. I saved the extra and happily used it on salad at home the next day. So overall ... very mixed. If better executed, it would be amazing, the concept was all right. And I did like the small side salad I cobbled together, but, the cous cous was just so mushy it did pretty much ruin it. Another day, another flight on Virgin America. Start with my many previous reviews (below) of Main Cabin or First Class for more background. I was flying Main Cabin Select, which meant I had "free" food and drinks. Unfortunately, I honestly do not like a single snack they have on-board. I love snack foods, so this is surprising, but really, they just have nothing I ever want. 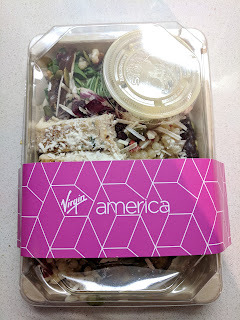 The meals used to fare much better, and I still fondly remember the salads I had the first few times I flew with Virgin America in Main Cabin Select. But I haven't seen a salad on the on-board menu in years, despite them always being listed on the website. Mediterranean Veggie Wrap with Cannellini Bean Salad. "Salad of lemon pesto bulgur wheat, hummus, grilled eggplant, caramelized onions, Persian cucumber, baby spinach, feta cheese, and roasted tomatoes, all wrapped in a sundried tomato tortilla. Served with a marinated cannellini bean, red onion, and oregano salad. " My choices, besides the cheese platter and snack boxes, were a turkey sandwich or a veggie wrap. I half-heatedly selected the veggie wrap, hoping I could at least dissect it and get a few tasty bites. I did not expect to like it in any way, since I don't like sandwiches or wraps, I don't like hummus, I don't really like cucumbers, feta, or roasted tomatoes, and that just left bulgur, grilled eggplant, spinach, and caramelized onions. Oh, and a side salad of beans? Yeah right, I never like beans. But, I liked this. I don't understand it. I mean, I didn't *love* it, but I enjoyed it far more than I thought possible. The wrap wasn't mushy or soggy. Nor was it dried out. I liked the sundried tomato flavor. Well, huh. The filling was also far better than I expected. I did push aside the cucumbers, feta, and roasted tomatoes after a first bite, but, the bulgar with lemon pesto, the hummus, and the slices of roasted eggplant were really quite tasty. The spinach was fresh and crispy and the caramelized onions had a good flavor. There were even plump, juicy, golden raisins in the mix, a strange ingredient, but, I really liked the sweetness. 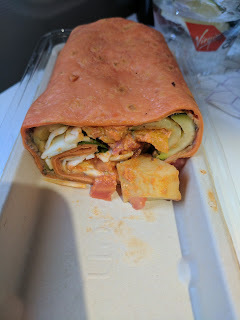 There really was a lot of flavor and good textures in the wrap, and it was far more fresh tasting than I thought possible. The only problem with this wrap was the fact that it included avocado cubes, not listed in the menu description. I'm allergic to avocado. I'm curious why they didn't include this ingredient in the description, since it seems like it would draw in more people? Another day, another flight on Virgin America from Boston to San Francisco (or, vice versa). This is the route I always take to visit my family. As a Silver member, I got upgraded to Main Cabin Select, so I was able to sample some food for free. 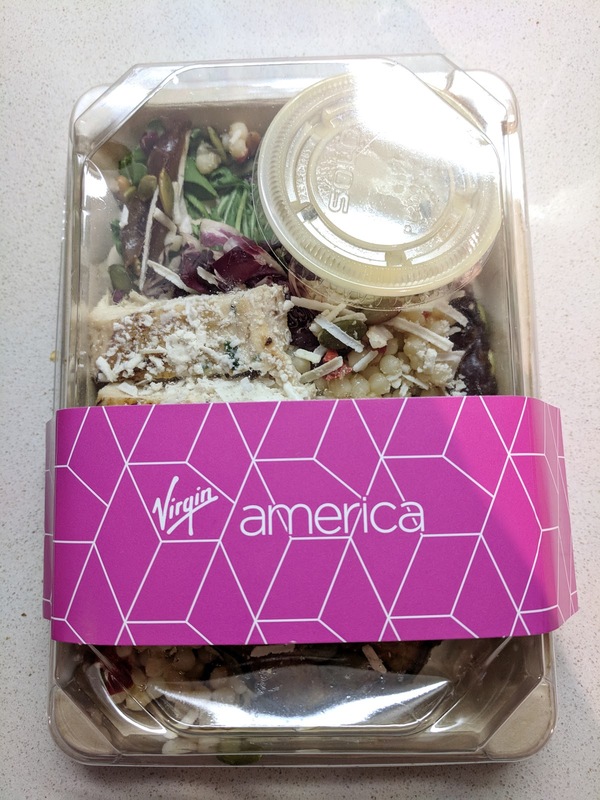 Normally I'm not particularly excited about domestic airline food, as it is all sandwiches and salads, but, I've had some really good salads on Virgin America flights in the past. Sadly, this was not one of those times. Ginger Chicken Soba Noodles. $8.50. 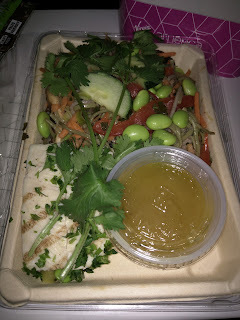 "Grilled sliced chicken breast, soba noodles, julienne red bell peppers, carrots, shiitake mushrooms, sliced scallions, edamame soy beans, sliced English cucumbers, cilantro sprig, and ponzu ginger sesame vinaigrette." Since I didn't want any of the sandwiches, and had good luck with salads in the past, I went for the salad, even though it contained chicken, an ingredient I loathe. The garnish on it was amusing, a very substantial sprig, er, branch, of parsley extending the entire length of the tray. Seriously, wat? The chicken portion was 3 slices of rather scary looking chicken. Scary in how ... fake it looked. All white meat, with perfect grill marks that looked painted on. Really ... fascinating. I didn't try it. The soba noodles were really mushy and all stuck together. And kinda dry. The veggies were all unremarkable. Shredded carrot, slices of red pepper, chunks of cucumber and mushroom, too much green onion, more parsley. None of it was very good. The dressing on the side was a solid mass, thick and gloopy. It seemed to be oil and lemon? I really didn't like anything about this salad. The woman next to me also ordered it, took a few bites of hers, and said, "Wow, this is kinda awful, isn't it?" Clearly not a winner. Neither of us really made a dent in our salads, and our flight attendant didn't seem surprised when she came to collect trash and we both tossed them. I didn't even bother try to get Ojan to try it. I can't imagine anyone would find this appealing. 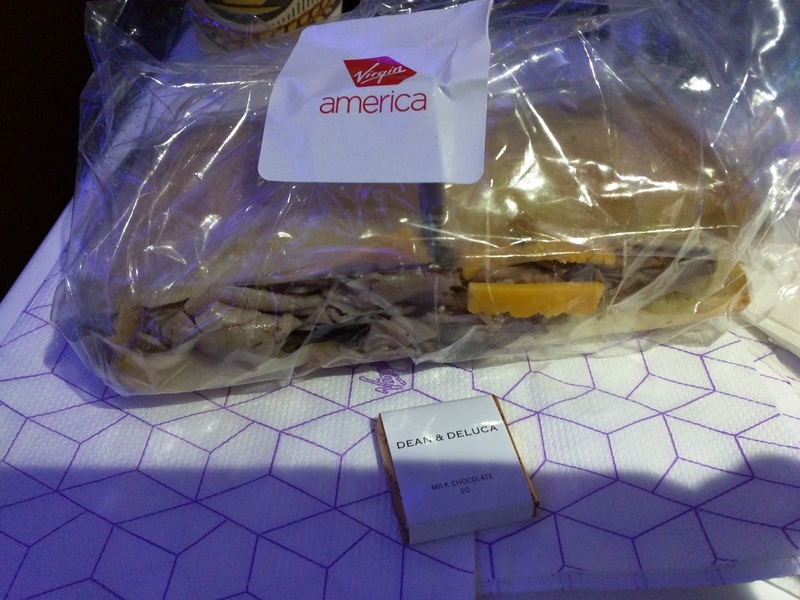 I've reviewed the food served on Virgin America several times, so, I'll skip all general intro this time around. 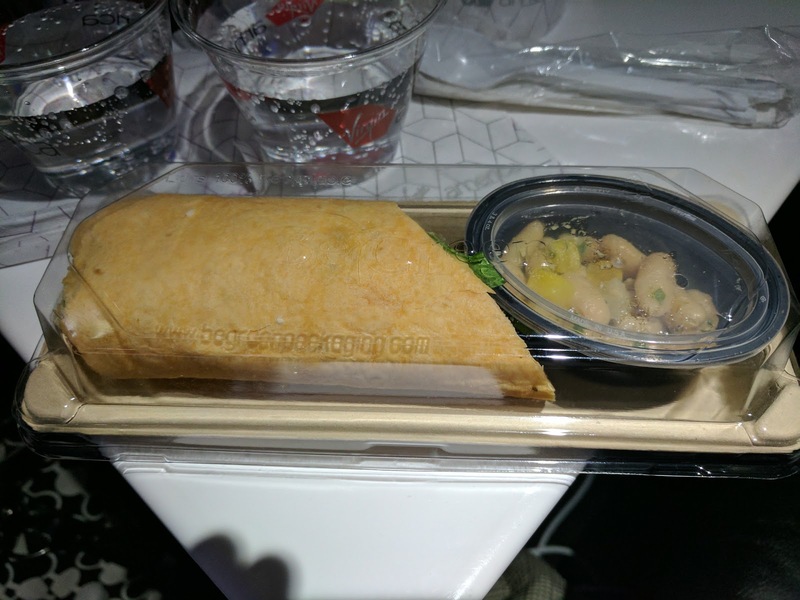 Please go read my other reviews of the Main Cabin dining from December 2013 and December 2012 below if you are interested, or, about my First Class experiences, and then return here for the latest updates. "Lemon cilantro tortilla with black rice, farro, edamame bean salad dressed with soy yuzu vinaigrette, roasted slivered almonds, edamame hummus, roasted red peppers, sliced cucumbers, arugula lettuce, and cilantro leaves." I know, I don't like sandwiches. I don't like rice. I don't like edamame. I don't like hummus. But ... there really was nothing on the menu I wanted. They got rid of the salads, which I really did enjoy. Plus, the description said "soy yuzu vinaigrette", which did sound promising. 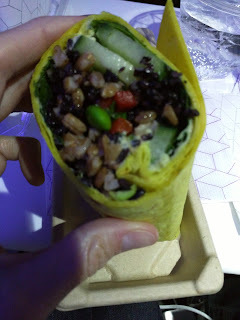 I didn't know the wrap would come with a mini fruit cup on the side, but that was the highlight. A single grape, some fresh enough pineapple, bits of mango, and a single strawberry. Awesome fruit? Nah, but it was fine, and I particularly appreciated the mango. The wrap however, had nothing redeeming in it for me. I never tasted any soy, nor yuzu, which was the only part I was looking forward to. The whole thing was really quite dry. The tortilla wasn't dried out at least, but the fillings were all just sooo drying. No creamy sauce, just hummus. And all the grains. Dry, dry, dry. I never should have ordered this, as it clearly wasn't going to be something I liked. I'll say the good parts: the cucumbers were crispy, the roasted red peppers quite flavorful. But ugh, not my thing. I wish they would bring back my salads! At least it was only half a wrap? 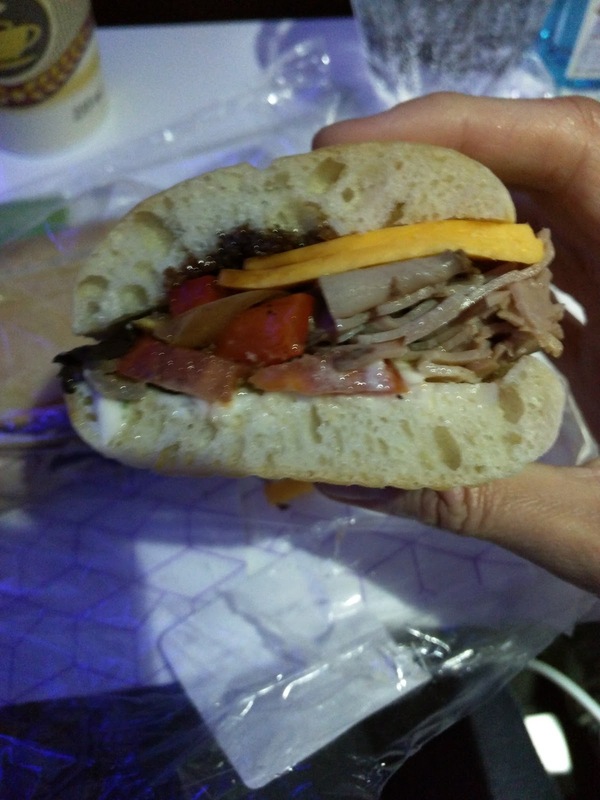 Ojan ordered the roast beef sandwich on his flight a few days prior, and told me he didn't like it (I wasn't with him to steal a bite! ), but, alas, I was still hungry after the lackluster wrap. So, I didn't heed his advice, and ordered it anyway. I was surprised when it arrived, as it was a full size sandwich, two halves. I thought that it would be like the veggie wrap and just half a sandwich. Whoops. I wasn't THAT hungry. It didn't come with fruit salad on the side like the wrap, but instead included a small Dean and Deluca chocolate. Even better! "Ciabatta bread, mesclun mix lettuce, sliced roast beef, mild cheddar cheese, sliced Roma tomato, sauteed pepper medley, balsamic glaze, and lowfat mayonnaise." Ojan warned me that the sandwich was horrible. He said the bread was soggy, the meat bad. I didn't quite agree. Ok, so the bread wasn't good. It wasn't soggy exactly, but it surely wasn't good. "Ciabatta"? I dunno, it wasn't what I think of as ciabatta. It certainly didn't taste fresh. The top piece of bread contained a little bit of the balsamic glaze. It soaked into the bread, so was otherwise lost. The bottom contained the mayo, a very thin layer, but, I do love mayo. I mostly discarded the bread, and just scraped the mayo off. The mesclun mix was fine, the sauteed pepper medley I really didn't like though, but mostly because I don't really like peppers. The roma tomato was rather mealy. But, the core components, the roast beef and cheddar ... weren't bad. Sure, the cheddar was just slices of pretty generic yellow cheese. It didn't exactly have much flavor, so yes, "mild" it was. But the roast beef was decent enough. Not fatty, not chewy, just fine. I did enjoy the roast beef, plus cheese, plus mayo. Obviously I wouldn't highly recommend this due to the lackluster bread, but the parts that mattered were high enough quality, and if you like peppers, you probably would have found the peppers nice as well. 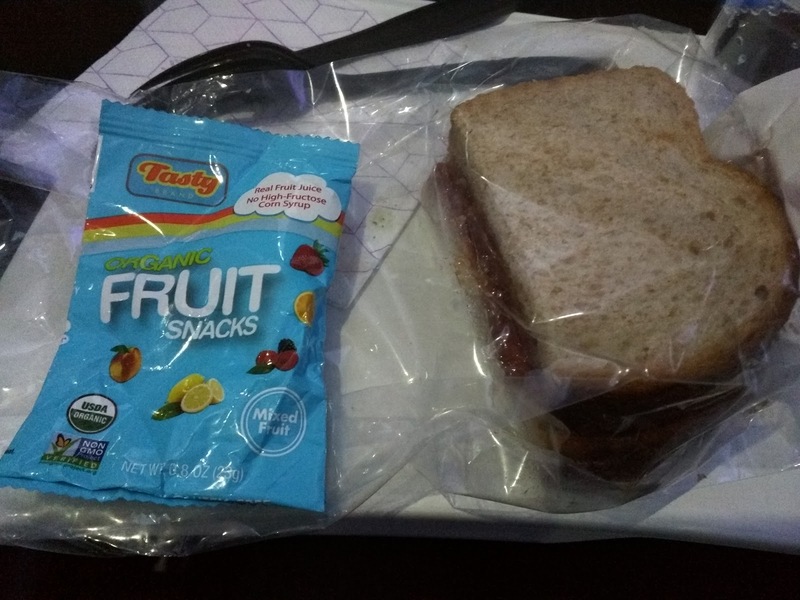 "Sliced wheat bread topped with creamy peanut butter and strawberry jam served with Tasty Brand Fruit Snacks." The pb & j is likely intended for kids but ... when all the other options don't sound great, what's an adult to do? Plus, seriously, who doesn't like a pb & j from time to time? The serving is only a half sandwich, like the veggie wrap. The peanut butter was smooth, creamy style, with a good peanut flavor. Basic peanut butter, but certainly good enough. The jelly was strawberry jam, not a smooth jelly, but also without any distinct berry bits. Sweet. Again, basic, good enough. The most notable thing about the fillings is that they use two layers of peanut butter, one on each slice of bread, with the jam in the middle. This helps prevent the bread from getting soggy, and really amps up the pb flavor. Smart move, Virgin. Overall, a decent, basic sandwich. When all else fails, it works. 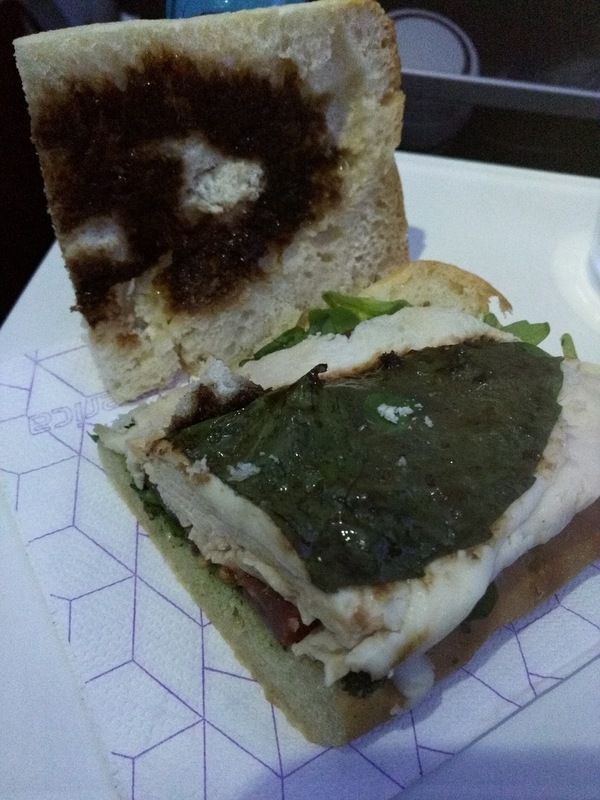 Chicken Mozzarella with Pesto Sandwich. "Ciabatta bread, arugula lettuce, basil leaves, sliced fresh mozzarella slices, sliced chicken breast, sliced Roma tomatoes, lemon pesto, and balsamic glaze." Now, I obviously don't like chicken, but the other components of this sandwich sounded great, so I figured I could just remove the chicken. A tomato and fresh mozzarella sando with pesto sounded fantastic to me! Chicken Mozzarella with Pesto Sandwich: Inside. I was curious how the sandwich was composed, so I opened it up. The bread was the same ciabatta we saw with the roast beef sandwich. A bit stale, a bit dry, but also a bit soggy. Not great. The top side of the bread had the balsamic glaze soaked in, so, in order to taste balsamic, you had to go for the bread. The bottom slice had the lemon pesto, really quite flavorful and delicious, and the winning element of the sandwich. On top of that was the lettuce, basic lettuce, and the sliced roma tomatoes. The tomatoes were fine, but really there wasn't much tomato. Since I was intending to remove the chicken, this left a more meager sandwich than I was expecting. More tomato please! Speaking of the chicken, it came next, and was slices of deli chicken, rather than a piece of grilled breast like I expected for some reason. There was tons of it. Doh. But at least they were generous with their protein? Next came the slices of fresh mozzarella. Decent enough, soft, but not particularly remarkable. On top was a basil leaf. Overall, the bread was clearly the worst aspect, and the other fillings good enough. I really liked the pesto, but I'm really never a sandwich girl. "This protein-packed meal combines Bumble Bee lemon pepper tuna, La panzanella rosemary crackers, Heritage roasted red pepper hummus, Crunchmaster multi seed crackers, Emerald's natural walnuts & almonds, and Happytimes veggie pals chews." 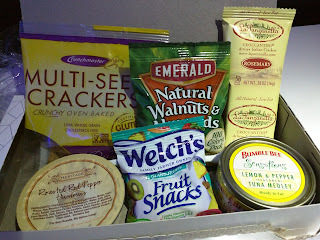 One one flight, I went for one of the snack boxes, rather than trying more sandwiches. None of them were REALLY what I wanted, like a couple with boring cheeses (munster? who eats munster?) or featuring hard boiled eggs or sliced turkey. I went for the "protein box" because I vaguely remembered liking at least the crackers before. The multi-seed crackers were again decent. Salty, crispy, flavorful. But I wanted something to dunk them in. I know that is likely what I was supposed to use the hummus for, but, I don't like hummus and didn't want it. I could have topped them with tuna, and actually would do that next time, except that I'd bring mayo. Tuna without mayo just seems ... wrong. I also really love the La Panzanella rosemary crackers. A bit of a strange thing for me to like so much because I don't generally get excited about crackers, and I often find rosemary too strong, but, these are strangely addicting, and quite fine on their own (although I'm sure they'd be better with cheese). The rosemary flavor is not overwhelming, and the crackers are thin and crispy. I'd gladly eat more of these! As I mentioned last Tuesday, I recently did some traveling, and I'll be devoting Tuesdays for the next few weeks to Travelin' Tuesdays! And what is a big part of travel for me? The culinary experience (uh, I mean, seeing my friends and family of course!). Last week, I started the review of my journeys with snacks in the Admiral's Club. Not extraordinary. I was eager to get aboard my Virgin America flight. I was flying Main Cabin Select, which is always such a treat. Not only do you have the normal Virgin America perks of in-flight wifi, tv, movies, and food ordering at your seat, you get unlimited food and drinks. And, completely unlike any other domestic airline, this is food you actually would like to eat! I normally pack myself meals for flights since I know what I bring with me will be far better than anything they have on the plane, but the last time I flew on Virgin America I was so impressed with the tuna niçoise salad that I risked it this time, and decided to go for the airplane food. I'm so glad I did! I was again blown away by the freshness and quality of their food. It makes me wish I could fly Main Cabin Select every time :) I'll be back on Virgin America for the Christmas holidays, but holiday pricing led me to stick with regular Main Cabin. As I write this up, I'm slightly regretting that choice! I again really enjoyed the food, and continue to be very impressed. Virgin America really sets the standard here. Udi’s Granola with Fruit and Yogurt. "Fresh fruit salad of pineapple, mango, and red seedless grapes, served with Udi’s gluten-free granola and fruit yogurt. " 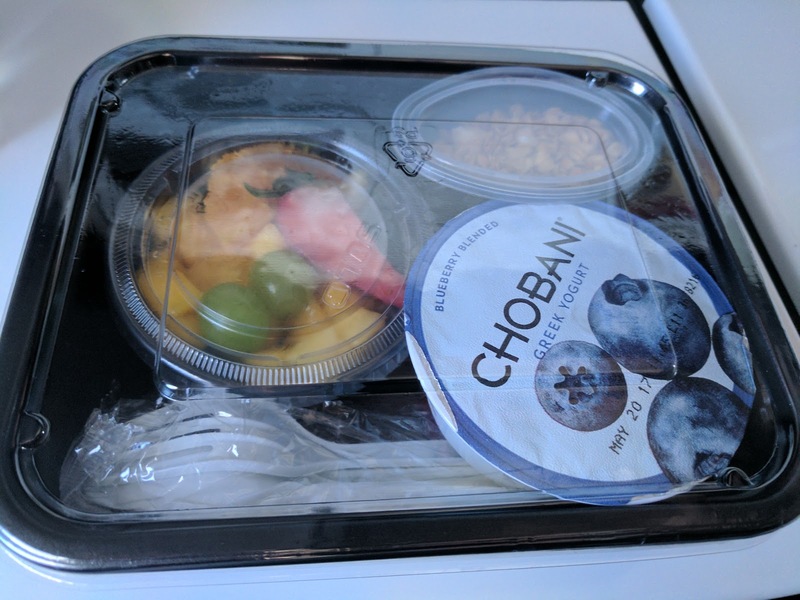 Since my flight left in the morning, I started with the only breakfast selection: the granola, fruit, and yogurt. The yogurt was Upstate Farms brand, strawberry flavor, nonfat. It really had no flavor at all. I would have never known it was supposed to be strawberry. Not that I like flavored yogurts anyway. It was basically just generic, runny, sorta sweet yogurt. The type I stopped eating years ago. I had a little of this, tried mixing in the fruit and granola, but really didn't care for it. 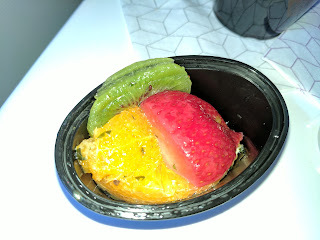 I was more hopeful for the fruit, since I've had some very good fruit on Virgin America flights in the past. 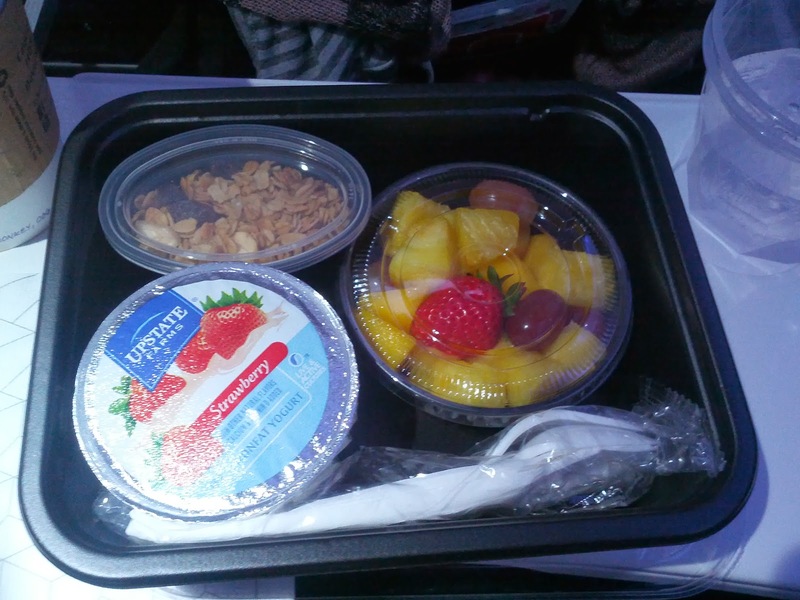 The first time I ever flew on Virgin America, I ordered the cheese plate, and it came with assorted fresh fruit. I was blown away by the quality of both the fruit and the cheese then (I've had it again more recently, and I've been less impressed, the cheese selection more mundane, the fruit dried instead of fresh). But anyway. The fruit was indeed good. My bowl contained four chunks of mango, sweet, and ripe. Really quite good for mango in the United State, and impressive for something pre-cut and served on a plane. There were also four red grapes, standard. The majority of the dish was pineapple, which was slightly overripe, but not bad. It was very juicy. Overall, I was impressed with my fruit, and quickly gobbled up the whole bowl. The granola however was my favorite part of the assortment. I had heard of Udi's before, but I hadn't ever had their granola. I've been missing out! It was really flavorful, and contained fun ingredients like banana chips. Since I didn't like the yogurt, I ended up just munching on the granola alongside my coffee, and I was a happy camper. I've tried, and reviewed, many granolas over the years, and this was some of the best I've encountered. I'd gladly seek it out again. Overall, this was a nice breakfast for the plane, and I'd get it again I just wish they'd swap out the yogurt. Arugula and Roasted Pear Salad. "Crisp romaine and baby arugula salad tossed with red seedless grapes and toasted slivered almonds, topped with pears roasted in fig mustard, and served with olive oil, balsamic vinaigrette, and diced brie cheese on the side." A few hours later, it was time for lunch. I looked at the Virgin America website prior to my flight, and had a few meals picked out that I wanted to try. There was a Vegetable and Plantain Salad that I was really eager to try, as I love plantains. And there was a Tomato and Mozzarella Sandwich, with sundried tomato and basil pesto on a cornbread baguette! Or, an interesting set of "Flight Bites", a collection of salads and chocolate mousse! I wanted them all. I was a bit torn between what to pick. But alas, I never had to solve that problem, as none were available. I even double checked with the flight attendant to make sure all the meals were indeed loading into the system. He had never heard of either of these choices before, and thought perhaps they were an upcoming menu that hasn't rolled out yet. Sadness. Instead, my meal choices were the standard snack boxes (hearty meal, protein meal, jet set kid's pack), the standard unappealing sandwiches (pb&j, veggie wrap, chicken sandwich), or this salad. Since I was really pleasantly surprised by my tuna salad last time, and I really just didn't want any of the others, at all, I went for the salad. Like the tuna salad, it far exceeded my expectations. The greens were a mix of romaine and baby arugula. 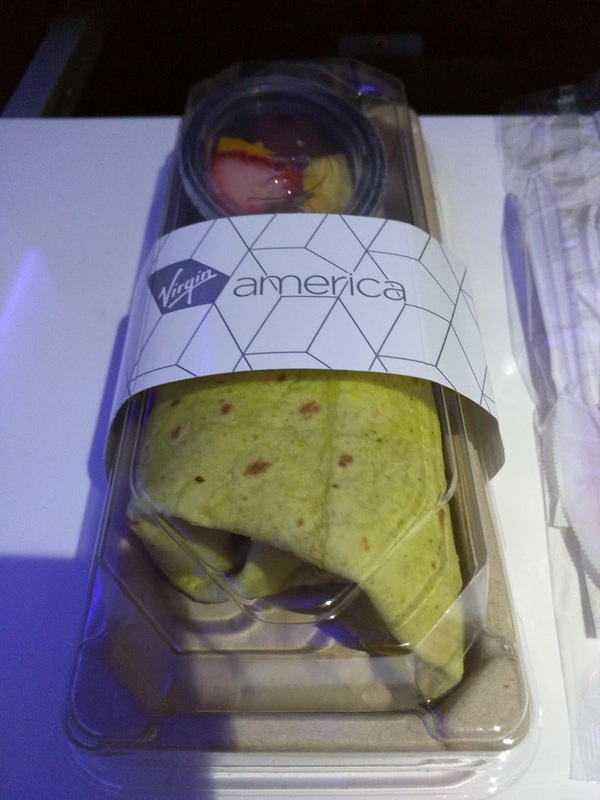 As always, Virgin America impressed me with the freshness of the product in their meals. Both types of lettuce were incredibly crispy and fresh. The romaine was juicy and succulent. The arugula even a bit spicy. There were a few slivered almonds, which added some additional crunch and flavor when I got some, but there weren't many in the salad at all. The grapes were same as in the granola/yogurt dish, standard red grapes, juicy and fresh. These all added up to be a decent base for a salad. The pears were the part I was excited for, since I do like roasted pears, and fig mustard sounded flavorful and tasty. But they were the only aspect of the salad that wasn’t good at all. The flavor was just … bad. I didn’t taste mustard. Or fig. And the pears were mushy. 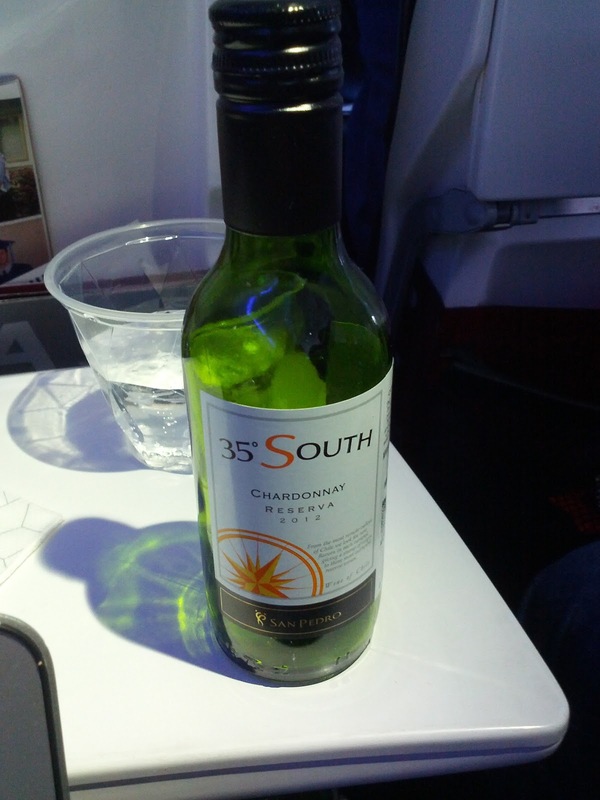 Just old tasting, completely unlike anything else Virgin America served. Just not good. But, there were only 4 slices. Had I liked them, this would have made me sad, but as it was, it wasn’t a problem. The brie was in tiny chunks, in a separate container. It was standard brie, not particularly good nor bad. Probably the same as on their cheese platter? The chunks did all stick together and required some work to separate, but it was nice that they weren’t on the salad originally. But the best part was the dressing. I really can’t say what it was, but I got addicted. At first I thought it was too thick, but once I used it more as a dipping sauce rather than a dressing, I couldn’t stop. It was tangy, it was sweet, and well, it was great. It was sweeter than I’d normally want for an entree salad though. Usually, I finish a meal and immediately want dessert. After this, I had no desire for more sweets. So, good for them in taming my sweet tooth? I did enjoy it, don’t get me wrong, but I think the sweetness maybe needed some taming. Overall, another impressive salad from Virgin America. Is it the selection I wanted? No. Was I still a bit sad that the more interesting choices weren't available? Yes. But, I was satisfied and finished everything but the nasty pears, so, it was a winner. If I was flying with the same menu again, I'd get it, but I hope they change up the selections before I fly again! 35° South Chardonnay Reserva 2012. I wanted something to pair with my salad, and thought that the red wine would be too over-powering, so I went for the white. I forgot that I'd had it last time. It wasn't great. I like a buttery chardonnay, and this was just a bit too harsh. Given no other option, it is ok, it did go well with my salad, and I did indeed finish it, but I'd pick the red next time, regardless of the pairing. For the holidays, I travelled home to New Hampshire. I had the pleasure of flying on Virgin America, always my favorite domestic airline. I know I shouldn't be impressed with it at this point, but wifi on the plane still sorta blows my mind. The time just flies by (yes, pun intended). The first time I flew on Virgin America, I remember saying that it was like being on the couch at home, but better. Comfortable recliners, internet, satellite tv (I don't even have cable at home! ), movies on demand, and food and drink brought to me with the press of a button? Yes, please! My recent trip was just as I remembered, and really quite enjoyable. I sat in Main Cabin Select, which gave me an unlimited supply of food and drinks, which I of course indulged in. I was honestly quite pleasantly surprised by the quality of the fresh prepared food. Tuna Niçoise Salad. Romaine and mesclun topped with green beans, albacore tuna, potatoes, tomatoes, hardboiled eggs, and kalamata olives, exclusively by Gilt Taste. Served with balsamic and olive oil dressing. This was an honest surprise. 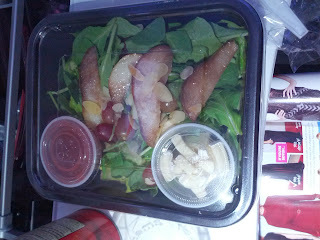 I did not expect a salad on an airplane to be remotely decent. I had even less high hopes for seafood. But I'm a brave girl, it was free, and as much as I love snack food, I wanted something else too. The base of the salad was mixed greens, a nice assortment, all crisp. The tomato came in tiny cubes, and was the most surprising part, as it is winter, and tomato is so often watery, flavorless, and not even red, and this stuff was decent. Not a fresh ripe heirloom tomato obviously, but so much better than I ever expected. The green beans were my least favorite element, more cooked than I liked. They weren't bad, but I would have liked them more al dente, with a bit of snap to them. The signature niçoise olives and hard boiled egg were unremarkable, decent, but nothing notable. The tuna, as I hinted at above, was a surprise. There was a generous amount of it, and it was all pretty good. Not fishy, no dark meat, just decent. There were also some chunks of cooked potato, that I originally thought were jicama. Jicama made no sense to me in this salad, but that is what they looked like. It took a while for me to identify them as potato. They weren't very good. The dressing was provided on the side, so as to not make it soggy. It was good, flavorful, and complimented all of the greens. Overall, I was just really impressed with it. Not Michelin star restaurant quality, but honestly, on par with what you'd get at any decent restaurant in the wintertime. And on an airplane. Bumble Bee Lemon Pepper Tuna: I didn't try this, but I think it was just a can of generic tuna. Ojan wasn't a fan, as he didn't like the lemon pepper flavor. Emerald's Natural Almond: I also didn't try these, but they were just generic almonds. Wild Garden Sundried Tomato Hummus: This came in a strange tube. I didn't taste any sundried tomato, just lots of hummus flavor. I don't really like hummus. 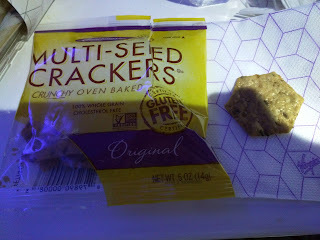 Multi-seed crackers: These were my favorite item. A nice mix of seeds, crispy, and well salted. I thought they were tasty just on their own, but also ate them with some cheese. Partner's Traditional Crackers: Plain crackers, not remarkable. Happy Times Veggie Pals, Carrot Orange Apple Chews: These were super strange. They had carrot juice and some fruit juices. They were chewy, but otherwise, not very good. 35º South Chardonnay Reserva, 2012. This was better than I expected. It wasn't good, but it wasn't offensive. Not bad for generic white wine, and it paired well with my salad. 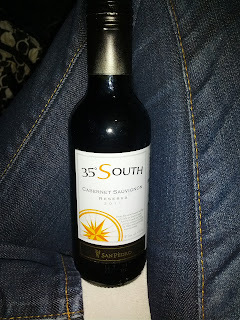 35º South Cabernet Sauvignon Reserva, 2012. Again, better than expected. 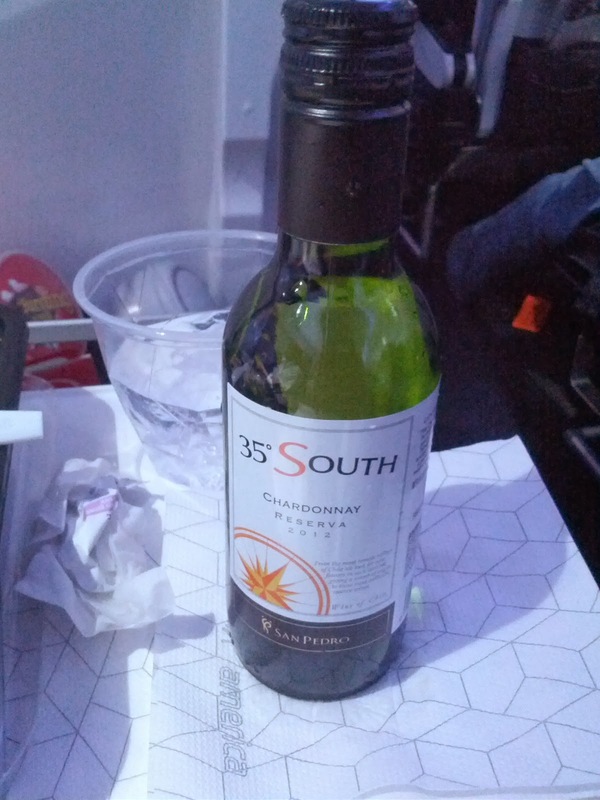 Not all that complex, but pretty drinkable and enjoyable for airplane wine. 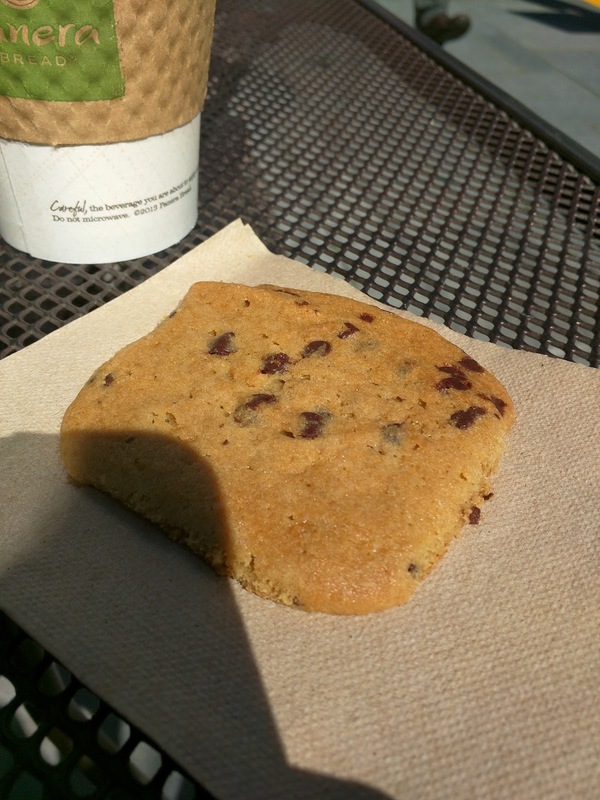 I've reviewed nearly all the Panera cookies before, but there was one more left to try. "A coconut, chocolatey craving satisfied in two bites. A traditional small coconut macaroon with the bottom dipped in chocolate." One day, I used Panera's Rapid Pickup option to make an order from my phone earlier in the day, with a pickup time set to when I'd be nearby and could just swing in to grab my bagel thin, intended to be used to make melts for dinner. But when I arrived ... no bagel thins. In fact, they were entirely sold out of bagels. Doh. It turns out that when you pre-order, it doesn't actually pull it from inventory. To make up for this, Panera offered me any pastry item I wanted. No pastry item was going to be a substitute for my dinner melts, so I used it as an opportunity to just try something new. The one type of cookie we had never tried before: coconut macaroons. The macaron was ... pretty much a standard macaroon. Soft, shredded sweet coconut. Nothing particularly notable about it. The dark chocolate it was dipped in however was quite good, really dark, smooth, flavorful chocolate. I was impressed with the chocolate. 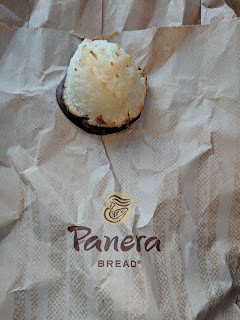 The macaroons turn out to be one of the cheapest items sold at Panera ($1.09 at my store), and, one of the lowest calorie. By a shocking amount. A single macaroon is only 140 calories, compared to Panera standard fare of the 440 calorie lemon drop cookie (or even worse, the 800 calorie Kitchen Sink cookie! ), the 720 calorie pecan rolls, 550 calorie cinnamon crunch scones, 580 calorie pumpkin muffins, 540 calorie bear claws, etc. So, if you like coconut, and want a little sweet treat, this one is not a bad idea. As I've said many times, I don't really like cookies. 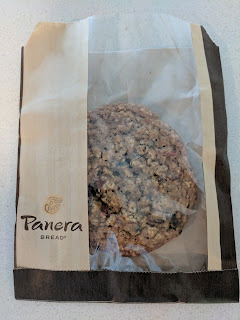 But, Panera often adds freebies to my account in the form of pastries, and I've never liked most of the baked goods there (aka, the muffins, the coffee cake and danishes, and most of the scones), so, I finally ventured out to try most of their cookies over the past year or so. The cookie lineup changes every so often, but always features their signature Chocolate Chipper (available in a petite size as well), a classic shortbread, and some seasonal version of an iced and decorated shortbread. Other than those, they seem to introduce new cookies a few times a year, trying to find some crowd pleasers. I'd like to note, they don't ever have peanut butter cookies, which would be my top choices! Anyway, for the most part, I expected to try the cookies, take some notes, and hand over to a cookie-loving friend. I was pleasantly surprised that I genuinely liked a couple of them. Oatmeal Raisin with Berries Cookie. $2.39. "A chewy oatmeal raisin cookie with sweetened, dried cranberries and infused, dried strawberries and blueberries." Every once in a while, I actually like oatmeal cookies, particularly soft ones, and particularly when they miraculously aren't oatmeal raisin. I hate raisins, and I'm so grumpy they have taken over the oatmeal cookie market! Why! Anyway, this looked like a big, soft, butter cookie, with oatmeal, and NOT raisins! Score. The verdict? It was ... fine. It was actually quite soft, which I appreciated. And it did have a decent distribution of bits of dried cranberries, strawberries, and blueberries, decidedly NOT raisins. But it wasn't particularly buttery or interesting in any way. I gladly handed it off, and wouldn't want another. Raspberry Almond Thumbprint Cookie. $2.19. "Almonds and a fruity hint of raspberry jam and powdered sugar. A perfect little treat. 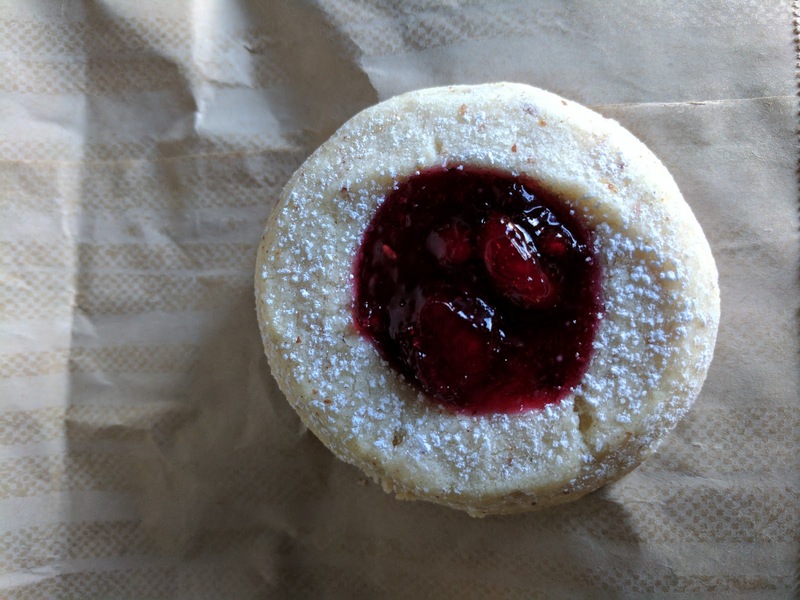 An almond butter cookie with a thumbprint of raspberry jam and dusted with powdered sugar." I really liked this. It was buttery and crumbly, with little bits of almond inside. The powdered sugar added a nice touch of sweetness, and the raspberry jam in the center tasted fresh and wasn't too gooey or sweet. A shockingly good cookie, and I'd gladly eat another. On one visit, there was a huge, I mean, huge, cookie on the shelf, unlabelled. I asked what it was, and the worker told me it is the "kitchen sink" cookie. It seemed to have everything in it, and sounded interesting, but it wasn't eligible for my freebie. I didn't get it then, but I couldn't help but notice it every time I visited. I had to finally get it, as ridiculous as it was. It was too big for any of the normal pastry bags, so, he put it into a giant box. "A salty, chocolatey, caramel confection big enough to share. A large cookie with semi-sweet chocolate, milk chocolate, caramel pieces, pretzels & finished with flake salt." They aren't kidding when they say this is "big enough to share". I looked it up later online, and, I kid you not, it has 800 calories (and 43 grams of fat!). In a cookie. Yes, compare that to their "petite chocolate chippers" with 100 calories, or even the regular chocolate chipper with 380 calories, and you'll realize the scale I'm talking about here. This is a monster. And he wasn't kidding when he said it had everything in it. While chocolate (both semi-sweet and milk) flakes were certainly the dominant visual item, the caramel actually dominated the flavor, super sweet, and plentiful, infused into nearly every bite. The chocolate helped balance the sweet though, and the large flakes of salt on top complimented it nicely. It was a crispy cookie, but mostly in a caramelized way from the toffee bits, rather than a cooked too long way. I don't normally like crispy cookies, but it worked here, since it was so caramelized. I didn't find any bits of pretzel in mine, which was a bit disappointing. Perhaps they were chopped finely and I just didn't notice? Another ingredient would be nice, but, I don't think was actually necessary given everything else in it, so I didn't mind too much. The cost of $4.39 sounds a bit insane, for a cookie, at a place like Panera. 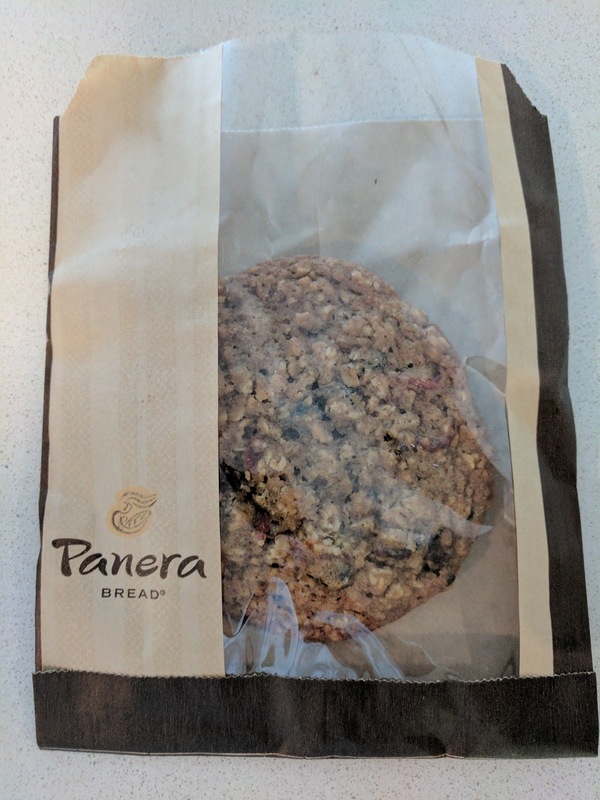 This isn't a fancy bakery, this is Panera, selling a nearly $5 cookie. It is twice the price of any other cookie they sell, because, well, it is more than twice the size. There is a reason it isn't eligible for the free pastry award! I'm glad I tried it, but I probably wouldn't get another, just because, well, still a cookie. 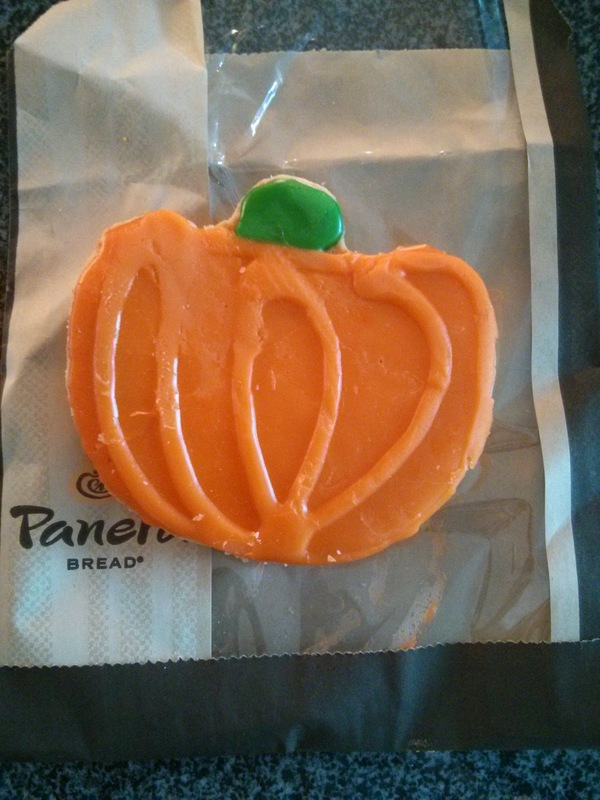 "Freshly baked, pumpkin-shaped shortbread cookie decorated with icing to look like a jack-o-lantern." I have a memory of really liking Panera shortbreads years ago. And what is better than a shortbread? A decorated shortbread! Panera seems to always have a seasonal shortbread, I recall seeing Easter Eggs around Easter, tulips and daises in the Spring, flip flops in the summer, mittens in the winter, etc. The astute reader will realize that this is called a Jack-O-Lantern cookie, and the website shows a cookie with a face on it. Mine had no such face. I guess the decorators were lazy that day? All cookies in the store were faceless. Pumpkin, yes, Jack-O-Lantern, no. I wasn't very good. The icing layer was too thick and just sweet, the cookie itself was crumbly, too soft, sugary, and didn't really seem that buttery, the defining characteristic of a shortbread. And ... this was the shocking part, it was 450 calories! In a SINGLE COOKIE! Besides their plain shortbread (only 380), all the other cookies are also over 400 calories. I know Panera certainly isn't a healthy place, but it is a bit hard to believe that a cookie can rack up those stats. Definitely not worth it. $2.49 price for a large cookie I guess was fine, and they are only 99 cents if you get a meal. "A traditional favorite, freshly baked and made with semisweet chocolate chips." I got this for Ojan, who does actually like cookies. It looked like exactly the sort of cookie I wouldn't like. On the rare cases where I like a cookie, it is soft and gooey. This looked hard and crispy. Not my style. Of course though, I tried a bite. It was actually loaded up with tiny chocolate chips, far more than it looked like. The bottom view would have revealed just how loaded it was. The chips were tiny though, so, you didn't really get a deep chocolate flavor. And it was indeed crispy, and quite thin. Highly unremarkable. It also tasted very unhealthy, but not in a good buttery way. Believe me, I'm all for a decadent dessert, the more butter and cream the better, but this just tasted ... unhealthy. Highly processed. I don't know how else to better describe it. 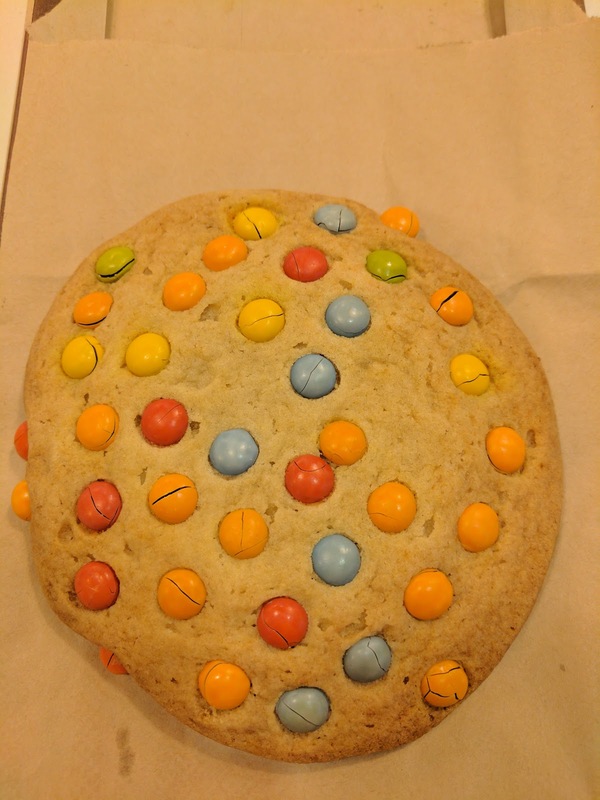 I was curious, so I looked it up when I got home, and saw that this cookie, the single, thin, not actually large cookie, was 440 calories. I don't really understand. I wouldn't get this again, obviously. 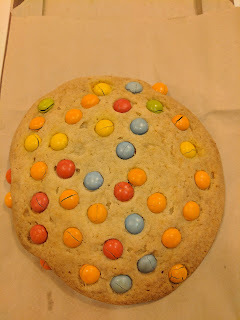 "Freshly baked sugar cookie topped with colorful milk chocolate candies." 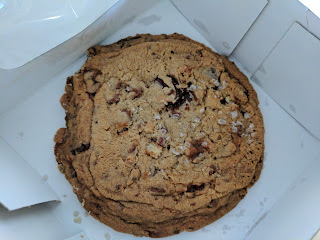 Another giant, hard, crispy cookie, another Ojan request. And ... yup, a hard, crisp cookie, not particularly good, just a plain cookie. He described it as "halfway between a shortbread and a sugar cookie". The little tiny milk chocolate candies were basically just small M&Ms in spring colors, very milky milk chocolate. Ojan liked the candy bits, but wasn't really into the cookie itself. I didn't like anything about it. Gluten-Conscious Triple Chocolate Cookie with Walnuts. $2.69. "A freshly baked flourless chocolate cookie with a soft, brownie-like texture, made with chocolate chunks, white chocolate chunks and walnuts." This seems like a crazy choice for me. I don't like cookies. I'm not a chocolate lover. And gluten-free baked goods are rarely impressive. But, literally every time I visited Panera, I couldn't look past these. They looked so good. So finally, I got one. And failed to photo. Sigh. It was a deep, dark chocolate cookie, with generous size chunks of both white and milk chocolate and walnuts. The texture was soft, as they described, kinda brownie-like, except it was a cookie, and still had a crisp exterior. A bit hard to explain really. I liked that. The flavor was also good, chocolately, fudgy. I loved the sweetness from the big white chocolate chunks (I know, I know, but I like white chocolate!) and the crunch from the walnuts. It is described as "gluten-conscious" which I think is because it is not baked in a gluten-free environment. It does not contain wheat flour, nor, any flour. I'm still a bit confused by that part honestly. The first ingredient is ... powdered sugar? I'm still not entirely sure how it holds together, but, it works out just fine. For a cookie, this was really quite enjoyable and I'd get it again.